Here is another of our latest websites, just launched for CSG Companies. The CSG website was recently launched with a special focus on what makes their agency unique and local to Fort Worth as a driving force for the site. We found and worked with a local photographer to add a one of a kind image of the newly build 7th Street bridge on the homepage. UBA resources like RSS feeds, Compliance, and Healthcare Reform are featured prominently. 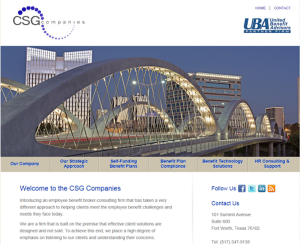 Visit the new CSG site at www.csgcompanies.com.